Just last year, Lexus debuted a production version of the sonorous LF-A – a mega fast, mega expensive (think $375,000), mega exclusive supercar for us all to drool over and daydream of being one of its 500 owners. And now, we have the CT 200h hybrid ‘premium compact,’ a 42 mpg achieving luxury wagon. While it may not have a V-10 engine, the CT is just as much an indication of the stronger direction in which the brand is heading. The entry-level CT has three different drive modes – sport, normal and eco – to maximize performance and fuel economy during various driving situations, reworked seating positions for improved comfort and a hatchback exterior design that most closely resembles a Mazda 3 in both size and shape. Performance, though not acceleration, has been a primary focus in this car, and it’s clear that it leans to the sporty side when you get behind the wheel. But Lexus has also simplified things for the potential first-time luxury buyer; there’s only one trim and just a few options. The CT may be about $350K less than the LFA, but the message is clear: Lexus is broadening its reach. 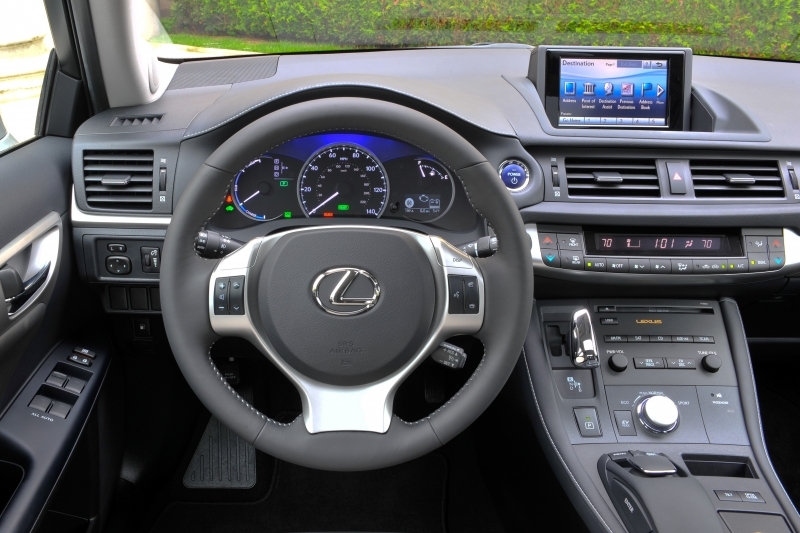 The interior is one of the more comfortable Lexus cabins we’ve experienced, with new angles for the seat, steering wheel and pedals. Three different modes give the driver more control over the feel of the car. Styling is great, inside and out. Cargo space isn’t impressive, and rear seating is going to be tight for leggy friends. Acceleration is underwhelming, even in sport mode, and the off-yellow exterior color was just a bad decision. Considering the CT is five inches shorter and only 100 lbs heavier than the Prius, we think gas mileage could be even closer to the 50 mpg mark. As you’d expect, comfort is an important aspect of this luxury car. Lexus modified their traditional seating position for a more ergonomic angle, and it makes a big difference. 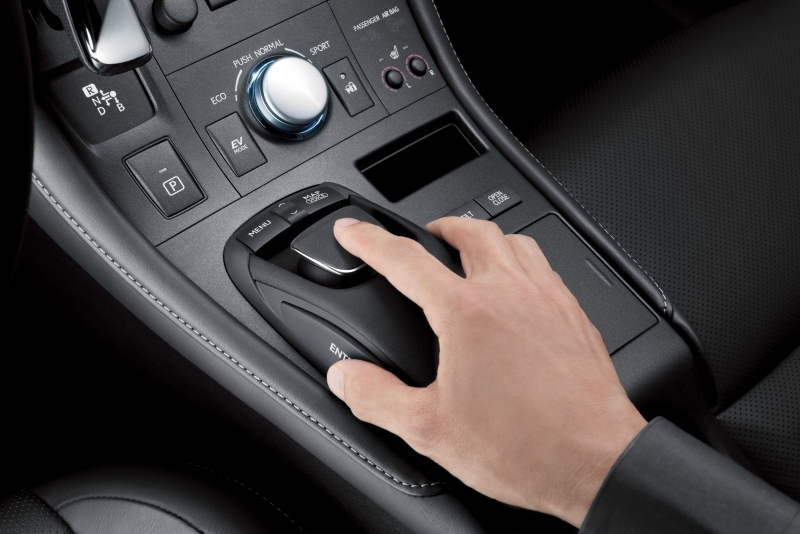 Within reach is a knob that can be adjusted to select three drive modes: sport, normal and eco. Sport amps up battery output full time to 650 volts and heavies up the steering, making the CT feel more performance minded. Eco reduces throttle response, helping to conserve gas. However, all modes will give you full acceleration should you need it. Handling is a step above the rest of the Lexus lineup, and the car stays level and well balanced in tight corners. Some wind noise finds its way through the window seals – more than you’d expect in a Lexus – and the CVT (automatic transmission) gets a bit whiny during hard acceleration. However, we’d argue that this car is one of the more comfortable, easy-to-drive Lexus models on the market. The engine and electric motors are the same as what you’d find in the Prius. A 1.8-liter four-cylinder Atkinson Cycle engine combines with electric motors to put out 134 horsepower and a maximum 650-volt output from the nickel-metal hydride battery. The CT is only available with a continuously variable (automatic) transmission. With only one trim, it’s safe to say that the CT has a long list of standard features, including fold-flat rear seats for more cargo space, a tilting/telescoping steering wheel with integrated controls and power seats, doors and windows. An impressive six-speaker audio system with iPod integration, Bluetooth and XM radio is standard as well. You’ll have to pay extra for the navigation system with the remote touch controller – a feature that uses mouse-like controls to scroll through the menu options – and a backup camera. The CT uses now typical full hybrid features like regenerative braking (which recharges the battery as you slow down) and stop-at-idle, and it’s capable of operating in either gas or electric modes separately. We were also able to reach about 23 mph in electric mode only, so it’s possible to improve upon the fuel economy estimates if you’re very feather-footed. Despite using the same hybrid drivetrain as the Prius, which achieves the magic 50 mpg, the CT sees slightly lower efficiency numbers. Still, it’s no slouch at 42 mpg city and 41 mpg on the highway. Good fuel economy and reduced emissions mean the EPA has bestowed it with an SULEV rating. Lexus made the front seats a priority when designing the CT, and it you can truly feel the difference. The cockpit-like center stack is easily within reach, and the cabin is filled with luxurious and soft-touch materials. Unfortunately, the rear seats are a bit tight in both shoulder and legroom. The cabin is lit differently depending on the drive mode selected – red lighting replaces the blue when you switch to sport mode. The CT is very clearly influenced by other compact wagons and bares similarities to the Audi A3 and the Mazda 3 in both design and size. In actuality, this car is much smaller than you’d think – it’s five inches shorter than the Prius – and features like the LED headlamps reflect its sportier edge. 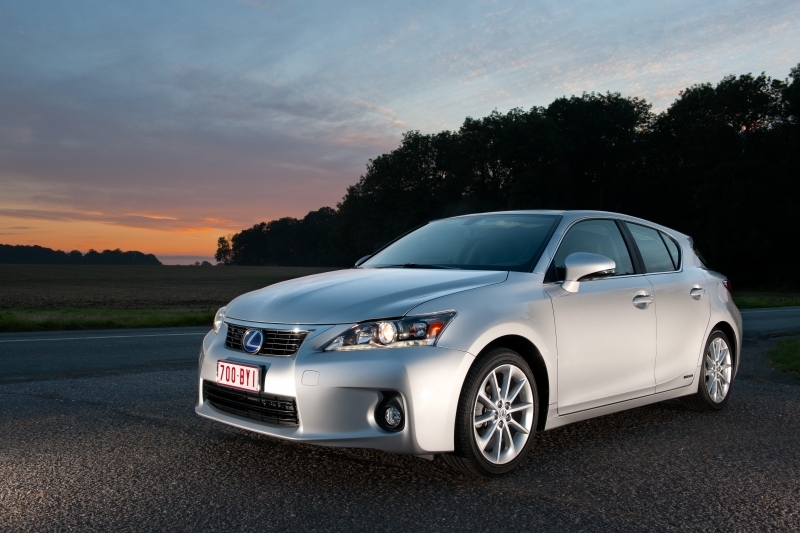 Pricing hasn’t been announced yet, but expect the CT to undercut the IS 250’s price of $32,000. The $27,270 Audi A3, $29,450 BMW 128i and $24,600 Volvo C30 are all worthy competition. 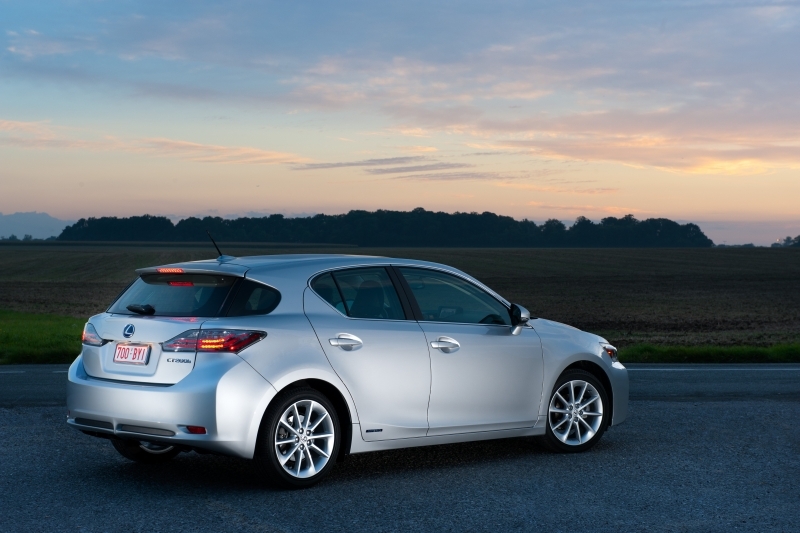 The CT 200h will appear at Lexus dealerships in early 2011. Whether you call it a premium compact or a luxury wagon, the result is the same – this is a strong entry into the segment. Comfort, standard features and styling are all spot on for this to go up against the European competition. Lack of an all-wheel drive option may hurt sales slightly, but really, a hybrid hatchback – and one that nets a solid 42 mpg – rounds out the Lexus offerings nicely.